The larger of the two churches built in the 14th century belonged to the Knights Templars. When the last grand master and their other leaders were burned as heretics in 1313, the order came to an end and the church was left over to the Knights Hospitalers who owned the adjoining building. 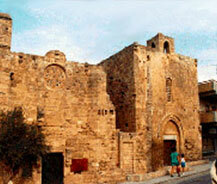 The building has been restored and is now being used by the Cyprus Art Society.